Knit Kurt Cobain’s sweater and save big bucks! Yesterday’s Guardian had a lovely little piece called Smells like Kurt Cobain: his $137,500 cardigan deconstructed. This was, of course, a report of how a cardigan worn by Cobain for a 1993 MTV Unplugged performance sold at auction for the grand and unexpected price of $137,500. 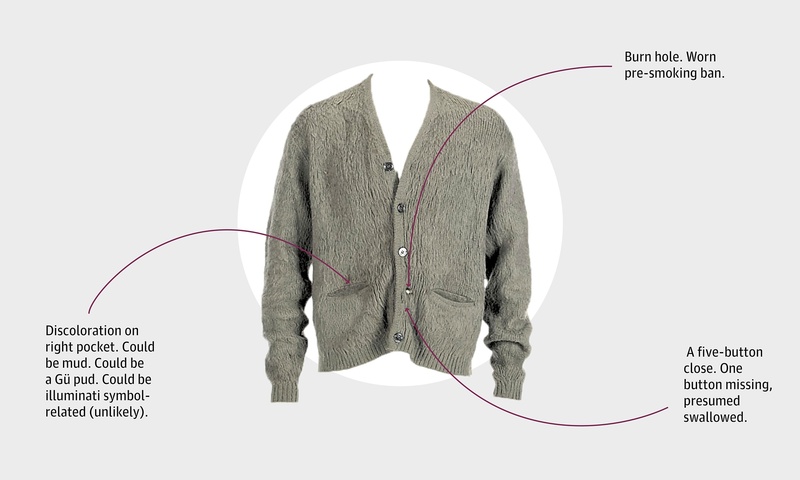 The cardigan is described as “a moth-eaten, oversized acrylic, mohair and Lycra mix”. What I liked best is the delightful infografic that accompanied the piece, which I have reproduced for you here. Knitters! Here is your chance! Finally, you can knit some something for less than it would cost to buy it! How many times have you patiently explained to muggles (oops! to non-knitters) that, yes you do know you can buy four pairs of socks for $10 at Walmart but you actually prefer to buy a skein of sock yarn for $25 and then labour for a month to turn out a pair? Or that, yes you could knit a sweater just like (actually probably better) than that cute one in Anthropologie, but the yarn will cost $175 and then you must tack on 60 hours worth of labour costs. But now, your time has come! Yes, knitters, you can KNIT KURT COBAIN’S SWEATER AND SAVE BIG BUCKS! If you look at a photo of Kurt wearing the sweater, you will immediately ascertain that it is knit in very affordable, fuzzy, acrilyc novelty yarn. You can likely find some in Walmart next to the socks. For a more authentic choice, however, you can raid a yard sale and buy an old moth eaten sweater and re-claim the yarn. Let’s say that you can find one for $10. That would save you a grand total of $137,490. Even after calculating in a hefty hourly wage for knitting – it still comes in under the price tag. But, knitters – I have saved the best news for last! This sweater has only 4 buttons instead of five! To knit the authentic Kurt Cobain sweater, you will only have to buy four buttons instead of five, thus saving you an additional 70 cents! As far as the smell (see the Guardian headline) well, that I leave up to you; I’m sure that we knitters are clever enough to sort something out. This entry was posted in Main and tagged FInancial planning for knitters, grunge fashion, Humour, Knitting, Kurt Cobain, Kurt Cobain's sweater, pop culture by knitigatingcircumstances. Bookmark the permalink. Hysterical!! It should become a kal! Thank you so much for this funny post!